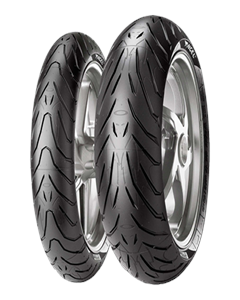 Tyres that are at ease for urban, sporting or touring use, designed specifically for the needs of Sport Touring motorcyclists. A new-generation compound with high silica content for sport touring use: excellent grip on dry surfaces with maximum safety also on wet surfaces and at low temperatures. The innovative tread design combines high mileage with a modern and attractive look. The new front and rear profile has been designed for the latest generation sport touring bikes, and can ensure neutral and uniform performance in all road conditions. Excellent mileage with constant and reliable performance right to the end of its life. On March 15th 2009, 15 Journalists and 12 Pirelli Testers set 7 FIM World Duration Records at Nardò Technical Center in Southern Italy. On just one set of Angel ST tyres they covered a distance of 5,135 km at an average speed of 214 km/h in a tough 24H non stop trial which proved the consistency and the performance of the new ANGEL ST.